Two British men say they have seen a seabird thought to have become extinct more than a century and a half ago. 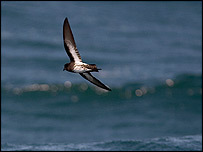 The bird, the New Zealand storm petrel, was spotted a short distance off the country's North Island in November. 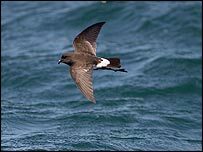 There had been a possible sighting of the petrel in January 2003, when it was photographed for the first time, though the image is said to be "questionable". But this time the two Britons say they are in no doubt the bird they sighted really is the one last seen in 1850. They are Bryan Thomas, a professional bird photographer, and his friend Bob Flood, a writer. They were in New Zealand to write an article for an ornithologists' website, Swarovski Birding. Mr Thomas told BBC News Online: "We were in a small boat off Little Barrier Island, not far from Auckland, on 17 November when we saw between 20 and 30 petrels. "Off New Zealand you expect to see two other species, the black-bellied and the white-faced storm petrel. "But the bird we saw is really distinctive and different. The underparts are white with a black streak, and the feet project further back than the tail. "There are differences in the detail of the plumage as well. And we were as close as 20 feet (six metres) to them. "There are two skins dating from the time the bird vanished in the 19th Century, and we now want those subjected to DNA testing. "We're confident that will prove the New Zealand storm petrel is a genuinely distinct species, and our visual evidence to back that up is absolutely spot on." Mr Thomas thinks the petrels breed on Little and Great Barrier Islands, where there is a sizeable rat population. He believes the rats are now in decline and that this has given the petrels a chance to re-establish themselves. The realisation that they had almost certainly rediscovered a lost species did not dawn on the pair till some hours afterwards, Mr Thomas told BBC News Online. He said: "There were just the two of us in this little boat with our boatman, hanging on for dear life in a very rough, choppy sea. "It was hard to photograph anything, and I didn't download the images till we were back onshore that evening. "Then I said to Bob: 'Come and look at this - there's something not right here'. I didn't realise were looking at something that had come back from the dead. "But I remembered the possible sighting from January, and then everything fell into place. "Since then my e-mails haven't stopped. It's a big deal for New Zealand - now they've got something back."